In its never-ending quest to expand internationally, the NBA continues to try and bring the game of basketball to India. Kenneth Faried dishes his thoughts on India after touring earlier this summer. The NBA is going to great lengths to grow its game in the subcontinent, officially opening the NBA Academy India in May, a training center for 21 prospects who were chosen after a nationwide search. As part of its effort to grow the game overseas, the NBA also routinely sends over players for community outreach and events. The latest NBA star to travel to India was Kenneth Faried, who visited the country in May to attend a basketball festival in New Delhi and appear on an NBA talkshow in Mumbai. Near the end of his trip, Faried caught up with The Crossover’s only Mumbai-born writer to discuss his love of traveling, working with kids and his experience in India. Rohan Nadkarni: Did you travel a lot growing up? What’s it like being able to see the world? 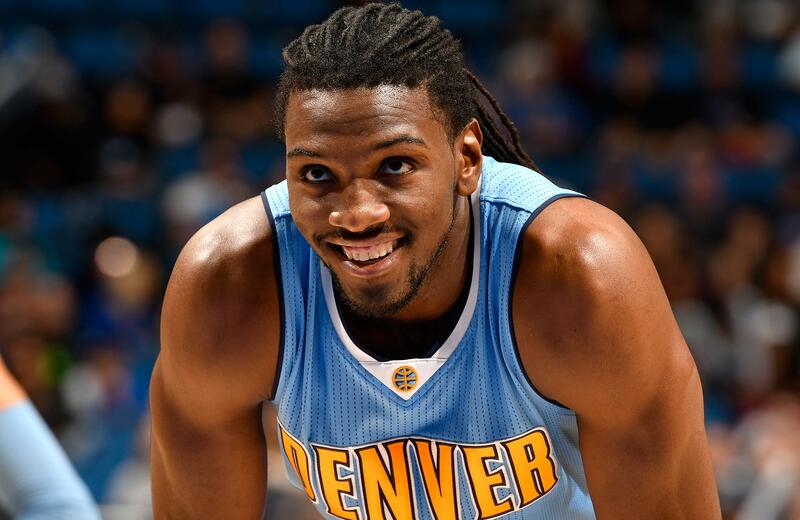 Kenneth Faried: It’s a blessing to be able to travel across the world. I did travel a bit growing up, but not out of the country. College was the first time I was able to go out the country. I’ve always loved to travel. When the NBA presented me the opportunity—my first trip was China—and then they said, “Hey, want to go to India this year?,” I was 100% with it. I wanted to come, explore the culture of India. I love learning new cultures, that intrigues me. I jump at these trips. I get to come out here, be around the kids, that’s my favorite part. I love the camps. Because it’s giving back, letting the kids know, I was young once too, and I didn’t have those opportunities to learn from someone who was already there. RN: What was the kids’ reaction when they saw you? KF: [Laughs] They thought I was [West Indies cricketer] Chris Gayle. Cricket is huge here. We respect cricket, we love cricket, we just want to be up there with them. Maybe be the No. 2 sport if we can. RN: How have you noticed the NBA growing in India? KF: I’ve noticed that the kids, they’re trying. When I went to do interviews with our NBA partner in India, these guys were analyzing the game. Having a conversation with them was amazing, these guys really know what they’re talking about and can really explain the game. And then a caller calls in and he’s only been watching basketball for three months, but he’s intuitive and knows what’s going on in the playoffs. It’s seems like everybody is just learning—three months ago, or six months ago—and I love it. RN: Have you done a lot of sightseeing? KD: I did. I got to see the Taj Mahal, it was the most magnificent thing I’ve seen in my life thus far. Just to be able to experience that. It was very hot! But, I loved it anyway. I loved the whole journey of going there. I soaked it all up. I was sweating like crazy but I loved it. RN: Have you tried any Indian food? KF: What?! That’s all I’ve eaten. I love Indian food. I love different cultures of food. And especially what India has. Y’all cook curry like no other. I love spicy food. I’ll just be adding extra spices to make it even more hot. They’ll add something to make it hotter and I’ll be like, “Yes! I love this. This is amazing.” Because it tastes good. It’s not hot to the point where your mouth is burning and your throat hurts and you can’t breathe. It’s hot but flavorful hot and I love it. RN: What do you hope to gain from a trip like this? KF: Honestly, just a new culture shock, a new culture experience. For me, if I reach one kid in this whole camp, and that kid decides—he may not make it to the NBA, he may not play overseas, he may not even want to play basketball—but he wants to go make somebody else a better person or help in the community. That’s what I’m trying to do, if I reach all of them that’s great, but I want to reach at least one. RN: How did you get involved with these overseas NBA trips? KF: Usually they reach out to you, or you can reach out to them and ask how you can help. You get to travel the world for free or shop in all these different cities. And you get to help kids. That’s the best part. I keep reiterating it, but that’s the main goal coming out here to all these different cities and seeing all these different people and places. To me, it’s to reach the youth. That’s who’s coming up behind us, that’s who we need to grab their attention to help them later on in life. To become those leaders, those doctors, those teachers that we need to keep things going. RN: What in your life has motivated you to work so closely with kids? KF: I just was always like that, even in college, I worked with kids at camps. I loved helping kids get excited for camps. I was just happy to give back. I come from North New Jersey. As a kid, I didn’t really have a NBA person to look up to, as far as, this person could come visit me or I could see them in person and they’re friendly. I didn’t have none of that. When I heard about these opportunities, I jumped at them, because I want to be one of those people who touched a kid’s heart, or a touched a kid’s mind, and make them say, “Hey, I remember when I was younger. Kenneth Faried, I met him, he told me something and I’m going to tell you this same thing.” To me, everybody can learn something from somebody. I learned something from the kids today. RN: What will be your biggest takeaway from this trip? KF: Personally, it’s the experience of India. Going to the Taj Mahal was the most exciting moment of this whole trip. Me being Muslim, and the Taj being built by a Muslim man who believed in the Quran, and who put the writing of the Quran over the door. It’s a blessing to come all the way out here, it was a blessing to even see that. To be able to touch and feel everything up close and personal. It looks marvelous in photos, but seeing it in person is even more magnificent, something your brain couldn’t even fathom from pictures.